Mother’s Day Gift Ideas that will Definitely Please Her! Looking for that perfect gift to surprise Mom with this Mother’s Day? Look no further than the Black Stainless Steel Suite kitchen appliance collection from the Oster®, Crock-Pot® and Mr. Coffee® brands! The Black Stainless Steel Suite is an assortment of small kitchen appliances with a premium Black Stainless Steel finish. Warmer and softer than traditional stainless, Black Stainless Steel provides a modern style that matches a variety of other finishes. The innovative finish reduces the appearance of smudges for low-maintenance care – simply wipe with a dry cloth to bring back its original luster. 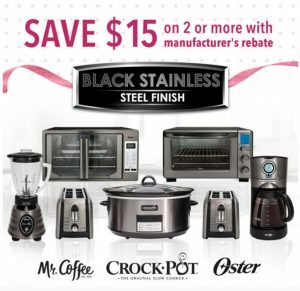 Now, you can save $15 on two or more items in the Black Stainless Steel Suite, all from your favorite brands – Oster®, Crock-Pot® and Mr. Coffee®! Treat Mom to a kitchen upgrade this Mother’s Day – get this limited time offer, here! How do you plan to celebrate the special women in your life this Mother’s Day?